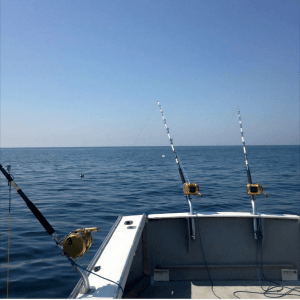 Tuna Fishing Charters Gloucester MA: Fish for the Giants Today! Tuna fishing charters can be one of the most exciting ways to spend a day fishing off of Gloucester. Once you’ve hooked into a giant you will be hooked for life. The adrenaline rush is something you can’t explain. Tuna can grow to be over 1000 pounds and swim 45 MPH! On board the Connemara Bay, we use multiple strategies to catch the giants. Early season (june) when the season opens we primarily troll squid bars for the fish as they are first migrating north. 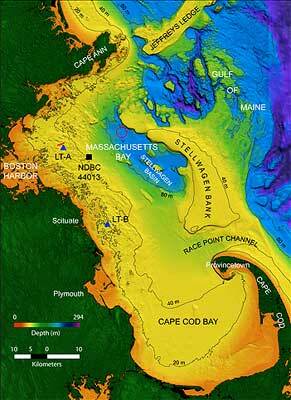 As the season moves forth we will set out the anchor and fish live as well as dead baits with the boat stationary. 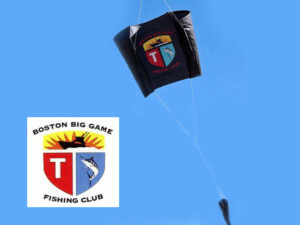 On days when there is enough wind we will even fly a kite to suspend a live bait on the surface. 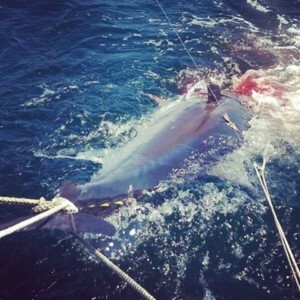 Whens the best time of the year to go Bluefin Tuna Fishing? 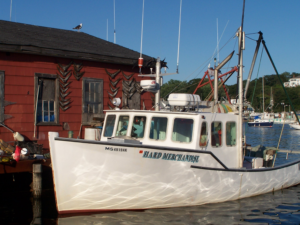 The best time of the year to go Tuna fishing in Gloucester is typically from July through October. Tuna fishing season is strictly regulated by a season with a limited quota that opens June 1st. On Tuna Fishing charters we anchor, drift, or troll on structure and banks located around Gloucester. These fishing hot spots include Stellwagon Bank, Jeffries Ledge, Old Scantum, The flags, Pigeon hill and more. Captain Kevin O’Maley has been fishing for Bluefin Tuna for over 40 years. He landed his first tuna at age 13 at the northwest corner of Stellwagon bank. 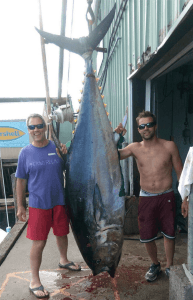 This fish weighed over 700 pounds. Kevin started his tuna fishing career as a mate on a sport boat which he captained when he turned 18. At the time Tuna fishing was centered around big tournaments. These contests would attract hundreds of boats to Gloucester. As Bluefin Tuna became more valuable in the 1970’s Kevin began to fish commercially for them. The Tuna fishery and its regulations have seen great change over the years. In Kevin’s early time tuna fishing he tussled with giants using hand-lines in baskets. 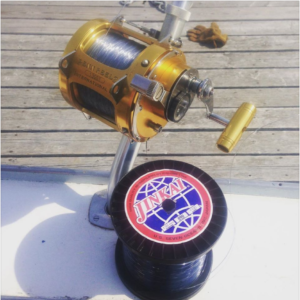 He later would use rods and reels and see the evolution of fluorocarbon line. Kevin also spent a number of years harpooning tuna from a pulpit on the Connemara Bay. Despite the changes in the fishery he claims the thrill has not changed one bit. How Much is A bluefin Tuna Worth? North Atlantic Bluefin Tuna are the most prized sushi fish in the entire world. With such a high demand, rod and reel or line caught tuna can fetch up to $30 per pound. The handling process of the fish is critical for this to be achieved. When a fish is landed it is vital to cool the fish down. This is done buy bleeding, gutting, venting, and icing the tuna properly. For more information about how to handle and clean and Bluefin tuna read here. The fish quality itself also weighs heavily upon the value of the fish.Miss placed dart placement when harpooning the fish can reduce the fishes value tremendously. It is vital that you avoid hitting the fish in the stomach. This portion of the meat is known as the torro and is the prime cut. Much of the value is determined by the fat content of the fish. 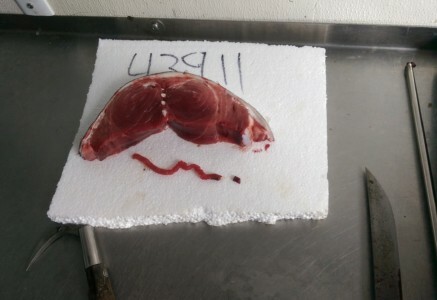 Bluefin Tuna dealers take cross-section samples of the fish to determine the best market for the fish. Sometimes this means shipping the fish all the way to Japan. Of course, this can be a risk as expenses are taken for freight. PLEASE NOTE *Federal law requires that highly migratory species, charter/headboat vessels must retain bluefin tuna which are 73 inches or greater in length. These tuna(s) will automatically become property of the boat and you are entitled to 15% the sale after expenses and to a maximum of the charter cost. 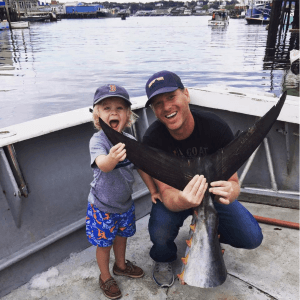 Tuna fishing is only becoming more popular as the rest of the world is finally getting a first hand view from Wicked Tuna which broadcasts on the National Geographic Channel. Come join us yourself for a day out on the water chasing Bluefin. Often times we will see some of the Wicked Tuna boats out on the fishing grounds. 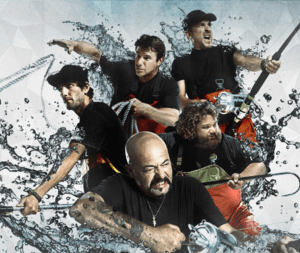 If you are unfamiliar with the tv show or the wicked tuna captains and boats learn about wicked tuna here.